Created by Steven Spielberg, Amazing Stories is a fantasy, horror, and science fiction television anthology series featuring an all-star roster of guest stars that originally ran on NBC from 1985 to 1987. The series was nominated for 12 Emmy Awards and won five. The first season episode "The Amazing Falsworth" earned writer Mick Garris an Edgar Award for Best Episode in a TV Series. The series title licensed the name of Amazing Stories, the first dedicated science fiction magazine. The show was particularly notable for the talent on display both in front of and behind the camera. Guest star appearances included Kevin Costner, Harvey Keitel, Gregory Hines, Charlie Sheen, David Carradine, Jon Cryer, Mark Hamill, John Lithgow, Christopher Lloyd, Andrew McCarthy, Rhea Perlman, Patrick Swayze, Sam Waterston, Danny DeVito, Seth Green, Kyra Sedgwick, Kiefer Sutherland, Milton Berle, Tim Robbins and many more. Meanwhile, directors and writers on the show included such legendaries as Steven Spielberg, Martin Scorsese, Clint Eastwood, Danny DeVito, Timothy Hutton, Robert Zemeckis, Tobe Hooper and Brad Bird. 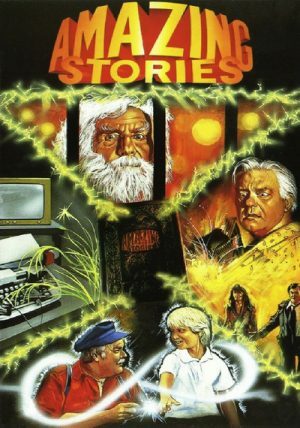 The Radio Times billed it as "a collection of fantastic tales of the bizarre and unusual, featuring a varying array of stars and directors..."